Whether you’re seeking a vehicle that will accommodate your worksite requirements or simply serve as a standard commuter, a new pickup truck is a perfectly logical target. When you begin diving into the specific brands and models, you’ll understand that Ram trucks are the superior offerings among rival trucks. The brand’s three pickup offerings provide everything that a customer could possibly want from a new truck: power, towing capabilities, interior/exterior amenities, and safety. You’d be hard pressed to find all of these attributes included in a pickup truck, but Ram consistently manages to pack all of these traits into each of their vehicles. This specific version of the iconic pickup brand may be designated as the “smallest” of the offerings, but that doesn’t mean the vehicle is any less capable than its peers. Rather, the Ram 1500 is one of the most impressive and well-versed vehicles in the entire industry, and that sentiment has to do with the incredible performance specs and interior/exterior amenities. As with any hulking vehicle, it naturally starts with the vehicle’s capability, as the pickup’s trio of available engine options provides all of the power a driver could possibly require of their new purchase. The 3.0-liter EcoDiesel V6 engine is the smallest of the bunch, but it still packs quite the punch with 240 horsepower and 420 pounds-feet of torque. Despite all of this power, drivers can also anticipate a 29-mile-per-gallon highway fuel efficiency, which ultimately equates to a 754-mile range. The 3.6-liter Pentastar V6 engine increases those specs, delivering an impressive 305 horsepower, 269 pounds-feet of torque, and a 25-mile-per-gallon efficiency. Predictably, the hulking 5.7-liter HEMI V8 engine is the most intimidating of the bunch, as the system is capable of cranking out 395 horsepower and 410 pounds-feet of torque. Of course, this truck includes a lot more than impressive engine offerings. Rather, engineers added a number of amenities that will positively influence the entire driving experience. For instance, the interior is adorned with rear wood accents, which add some opulence to the truck. Meanwhile, the available Alpine Nine-Speaker Premium Audio System (with accompanying Subwoofer and 12-Channel Amplifier) will provide an unmatched listening experience, meaning you’ll constantly be looking to take advantage of the accompanying Uconnect 8.4 system. Few pickups deliver the interior features that the Ram 1500 provides, meaning owners can expect an ideal and unique driving experience. The outside of the pickup truck is highlighted by the RamBox Cargo Management System, which allows owners to stay organized throughout their work day. The system includes lighting, allowing owners to access the unit at any time of day, and the extender/divider helps you keep all of your tools organized. Best of all, it’s drainable, meaning you won’t have to worry about the system getting flooded by any adverse weather. The Ram 2500 is prepared to get through any adverse terrain or conditions, and the vehicle’s incredible durability is a big reason for its capabilities. For starters, the 50,000-PSI steel frame makes for one of the sturdiest, most rigid pickups in the segment, and this inclusion will also play a major role in protecting occupants during a crash. Engineers also included a trailer harness connector (which will seamlessly integrate into your electrical system), heavy-duty hooks (thus assuring that your cargo won’t suddenly disconnect), the Ram Active Air system (promises optimal performance, even when the truck is taxed from towing a heavy load), and the innovative Tow/Haul Mode Select (adjusts your vehicle to accommodate your driving requirements). Meanwhile, the exterior of the truck is highlighted by a number of features that will make towing and hauling a whole lot easier. The inclusion of a fifth-wheel/gooseneck prep package makes it incredibly easy to attach a trailer to the back of your pickup, and the sturdy design all but assures that the hauled goods will stay connected to the vehicle. Of course, in the rare event that something does go wrong, drivers can rely on the cargo-view camera to investigate everything that’s happening behind their truck. Prospective buyers can opt for a number of additional amenities, as well. For instance, the box rail caps make it incredibly easy to load and unload any bulky cargo, and the easy-to-install system will protect your truck bed from any dents or scratches. The power exterior mirrors will assure that your vehicle remains in one piece when you’re traveling around tight corners, while the Tonneau Cover promises that nothing will accidentally fly out of your bed. There’s even a wheel-to-wheel side step, which makes entering and exiting the tall pickup truck incredibly easy. You’re going to be hard pressed finding a more rugged, hulking truck than the giant 2017 Ram 3500. Naturally, it begins with the pair of incredible engine options, which will deliver all of the power that a driver could possibly want from a brand-new truck. The 6.7-liter Cummins Turbo Diesel I6 Engine provides unmatched muscle, as drivers can anticipate 385 horsepower and 900 pounds-feet of torque. These specs end up influencing the towing capacity, which comes in around 31,210 pounds. Alternatively, the 6.4-liter HEMI V8 engine will take those power specs to another level, delivering an eye-popping 410 horsepower and 429 pounds-feet of torque, leading to a 16,520-pound towing capacity. These systems are accompanied by the brand’s trio of impressive transmission offerings, including the six-speed manual transmission, six-speed automatic transmission, and the Aisin automatic transmission. Owners won’t solely appreciate all of the power that’s lingering under the hood. Rather, they’ll appreciate the vehicle’s interior amenities, as well. The vehicle includes a number of features that will improve the entire driving experience. The upfitter switch makes it easy to connect any external part (like a plow or trailer) to your vehicle, while the Electronic Range Select allows you to adapt your vehicle for the impending conditions. Meanwhile, the built-in rear under-seat storage provides another spot where owners can hide their valuable cargo. Owners will also focus on that previously-mentioned RamBox Cargo Management System. The unit includes amenities like adjustable tie-down cleats, allowing you to secure bulky cargo like lawn mowers or snow blowers. The accompanying bed divider allows owners to organize their tools and cargo, while the AllSecure Central Locking System assures that any sneaky thieves won’t make their way through your equipment. Now that you’ve determined which of the Ram trucks you’re going to pursue, it’s time to begin the truck-buying process. If you live in the Keene, New Hampshire area, there’s truly no better place to make that purchase than from Keene Chrysler Dodge Jeep Ram. 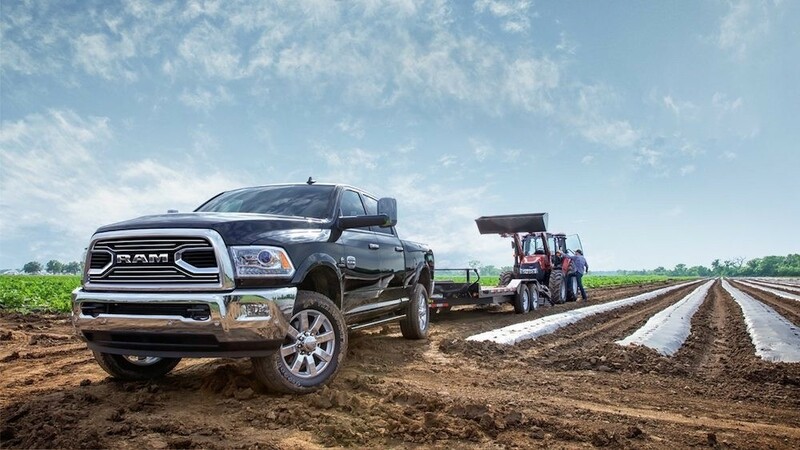 You’ll find the best prices in the area at this dealership, and the helpful sales team will work with you so you could be driving off the lot in your new Ram truck in no time.